Options For Small Dogs Necks up to 15"
Zodiac Flea and Tick Collar for Dogs is fast acting in killing fleas and ticks up to 7 months and stays effective even if the collar gets wet. 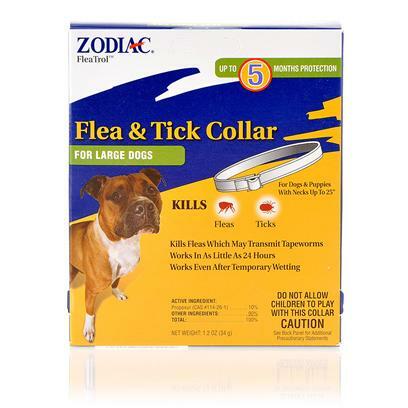 Zodiac Flea and Tick Collar for Dogs is convenient and easy to use. Buckle collar around the dog’s neck in a manner that 2-3 fingers can fit between the dog’s neck and the collar. Leave 2-3 inches extra and cut off excess. Dispose of excess in trash. Change collar after 7 months.